St Petersburg is planning to build on British expertise to develop a creative cluster. Source: Focus pictures. With 160 British firms already doing business in St.Petersburg, more are now being encouraged to look at the benefits of doing so. The former capital of Russia for two centuries, St.Petersburg is rightlyfamous for its cultural history. But it also has a long history of innovation which continues today. The banks of the Neva River saw Russia’s first railway, first electric bulb and the founding of its Navy, among many other things. 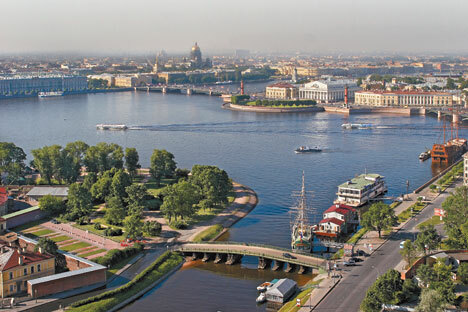 Five million tourists visit St.Petersburg annually – the same number that are resident there. But St.Petersburg is clearlyalso striving to become an innovation leader by developing its post-industrial potential alongside its tourism. The UK ranks first among the biggest investors in St.Petersburg. with Though the lion’s share of investment is goingin manufacturing. Indeed, Russia’s so-called northern capital has formulated an articulate cluster strategy, is an attractive place for many industries, including IT, construction, public utilities, waste processing, water purification, transport infrastructure, power, legal and financial consulting, pharmaceuticals, and renovation of industrial areas. It is through St.Petersburg that many European companies enter the Russian market. In 2012, AstraZeneca opened a bioinformatics-based Predictive Science Centre in the city, in partnership with St.Petersburg-based R&D centres. St Petersburg is home to around 12 percent of Russia’s scientific potential, thus living up to its Smart City designation. St.Petersburg is planning to build on British expertise to develop a creative cluster. Its central area includes 6,000 acres 2,400 hectaresof industrial land that can be converted into creative neighbourhoods. A delegation of St.Petersburg city officials and specialists in the preservation of its historic central area – where there are 29 industrial zones with a large number of architectural monuments requiring renovation – will travel to London at the end of this year to drum up interest. “St.Petersburg is a wonderful place to work. The local authorities have been able to create a comfortable environment unlike, perhaps, anywhere else in Russia”, says David Edwards, head of the representative office of an engineering company. British companies and architectsfirms are taking an active part in large-space public-private projects, such as construction of Pulkovo-2 international airport, the 1,600 ft Gazprom head office tower, a levee system, and an expressway linking the northern and southern parts of the city. Better known as a cultural capital than it isan industrial centre, St.Petersburg’s manufacturing index is growing by 13 percent per annum – double the average rate for Russia. The manufacture of electronic and optical equipment, as well as steel making and wood processing are growing fast, while sales by St.Petersburg-based organisations increased by 21.2 percent last year. More than 270 new manufacturing facilities were launched in the city in 2011, including phase two of Severstal’s sheet-metal rolling mill; production and warehousing facilities with a total area of 1,290,000 square ft; 2,280,000 square ft of retail space; a sea passenger terminal, and much more. As of January 1 this year, nearly £475 million was invested in the city by British investors. This article was prepared in co-operation with the St.Petersburg State Committee for External Relations.